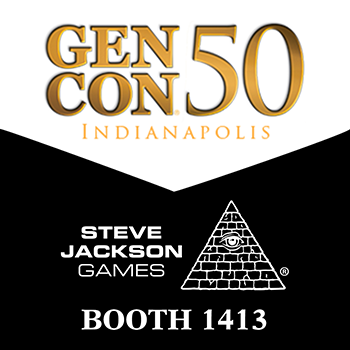 Daily Illuminator: Join Us At Gen Con! August 17, 2017: Join Us At Gen Con! Welcome to the first day of Gen Con! Our team has been in Indianapolis for a few days now, putting the finishing touches on our booth, preparing the MIBs for hours of gaming, and making sure that the Munchkin Tavern is ready for the opening bell later today. (Please note that there is no bell, though there probably should be – bells are pretty sweet.) Months of hard work by Guy, Jimmie, Andreas, and many others is going to be put to the test today, so if you are at Gen Con, please stop by booth 1413 and thank them. It is only because of their planning and efforts that I can walk into the convention today completely relaxed, knowing that any last-minute troubles have already been resolved and that our booth is ready for you. If giant cybernetic tanks and futuristic wargaming are more your speed, we encourage you to take a closer look at Ogre Sixth Edition and the upcoming Ogre Miniatures Set 1. We're running Ogre demos in the booth, and the display case is stocked with the available and soon-to-be-released plastic miniatures. You cannot take the minis home with you, but you can always support the current Ogrezine project on Kickstarter at the highest reward level to receive the minis late this year when the set reaches our warehouse. And Steve will be signing at the Munchkin Tavern, so be sure to bring your Ogre game to autograph! We've also got a sneak peek at the Ogre video game! Auroch Digital just launched the Steam page, which you can add to your Wishlist to get notified when it comes out later this year. For Munchkin fans at the show, stop by our booth to play the new Munchkin Shakespeare Deluxe game and get a look at all of the Munchkin Shakespeare swag that's on display in the glass cases. Additionally, we're revealing a new Munchkin game at Gen Con, our first Munchkin title of 2018 - and it's already at print! (All I can say now is: Moop is back.) In the evenings, after a long day of playing Munchkin at our booth and with the MIBs, you can swing by the Munchkin Tavern for eats, exclusive promos, awesome Tavern goodies, and even chances to get your Munchkin games signed. Last, later today, we are announcing the release date for the Munchkin Collectible Card Game and its first two expansions. The game has been a challenge for our team – do you know how much art goes into a CCG?!?! (Spoiler alert: it's a lot!) But we can officially report that the base set is finished and ready for print, the first expansion is nearly complete, and we have a strong start to the second expansion; all three titles are on track for release in 2018. The Munchkin Collectible Card Game has shaped up to be an amazing parody of the CCG format as well as a fun game – bringing in Eric M. Lang and Kevin Wilson guaranteed that we had the talent to make this a strong release – and part of my own time at the show will be spent showing the game to our business partners and a few retailers. If you're at Gen Con, we look forward to seeing you. And if you couldn't make it this year, please keep a close eye on Facebook and Twitter over the next few days, because Hunter and Rhea have some great reveals, live videos (if our signal stays strong! ), and photos planned for each day of the con.